Synthetic Polymers are Plastics in Your Cosmetics—Should You Avoid Them? Annmarie Skin Care > Ingredient Watch List > Synthetic Polymers are Plastics in Your Cosmetics—Should You Avoid Them? These chemicals are in the same family. Called “synthetic polymers,” they are man-made polymers—chemicals made of a large number of similar units bonded together—typically derived from petroleum oil. The more typical name for these chemicals? Plastics. Here’s why you may want to avoid these ingredients when shopping for personal care items. Many personal care products include synthetic polymers, which may pollute the environment and contain potentially harmful contaminants. Scientists discovered how to make synthetic polymers in the chemistry lab. Examples include nylon, polyethylene, polyester, Teflon, and epoxy. Typically, these types of polymers are not biodegradable, and can last for hundreds of years before degrading. There are also natural polymers in the world, but these occur in nature and are often water-based. Examples include silk, wool, cellulose, pectin, and proteins. These are naturally biodegradable. Natural rubber: This can be found in nature and harvested as a milky liquid from several types of trees. It is sticky, and doesn’t last long as it can rot. Synthesized rubber: This can be made chemically using isoprene and other chemicals. It can be made to have greater durability and smoothness. Because of the advantages of synthetic rubber, it’s most often used in various industries today. Thickening & gelling polymers: These are used to increase thickness in things like shampoos, conditioners, creams, and lotions. Formulas appear more rich, smooth, and creamy. Examples include polyethylene glycols (PEGs) and carbomers. Fixative polymers: These are the ones that help fix the hair in place. You’ll find them in sprays, lotions, gels, and foams. Examples include polyimide-1, polyquaternium-11, and PVP/VA copolymers. Conditioning polymers: These deposit, adhere, or absorb into the proteins of the skin and hair. They improve skin feel and hair manageability, and make the skin and hair softer and smoother. Examples include polyquaternium-6, polyquaternium-7, and polyquaternium-11. Silicones: These are polymers that contain silicon atoms or silicates. They help protect, condition, pearlize, moisturize, thicken, and emulsify. They are also added to cleaning products to reduce the irritation of harsh surfactants. These aren’t necessarily bad or unsafe in small doses, but we are using so many of them today so frequently, that sometimes they can cause problems. Between 1970 and 2003, plastics became the fastest growing segment of the U.S. municipal waste stream, increasing nine-fold. Marine litter is now 60-80 percent plastic, reaching 90-95 percent in some areas. Plastic is harming marine life, including albatross and other seabirds, who ingest plastic. Sea turtles also ingest plastic bags, fishing lines, and other plastics. Plastics are known to absorb pollutants, creating unknown health hazards. We talked about some plastics like these in a former post (“Are You Polluting Our Waterways with Plastic Microbeads?”) explaining how those tiny ones in your body wash can flush down the drain and end up polluting waterways. No matter where you find these products, they are similar in makeup, and tend to negatively affect the environment. Let’s talk about two specific polymers that we find in personal care products: carbomer and sodium polyacrylate. Carbomer: This is a class of chemicals made from acrylic acid. They are thickening agents that help control the viscosity and flow of cosmetic products. They are also solvents, helping formulas to stay well mixed. You’ll find them in styling gels, facial moisturizers, sunscreen, shampoo, anti-aging treatments, cleansers, and scrubs. Though generally considered safe, they can sometimes contain “neutralizing agents” TEA or EDTA, which we wrote about in a former post. These can carry contaminants that can be potentially carcinogenic. 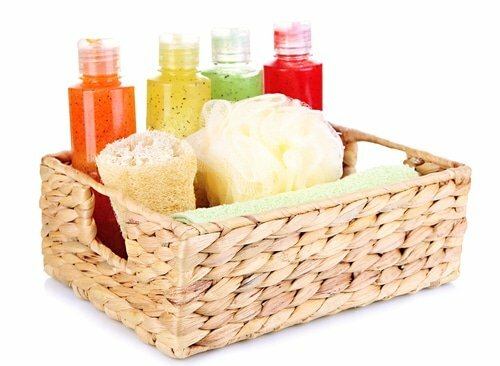 Sodium polyacrylate: Also called an “acrylic sodium salt polymer,” this chemical is used as a thickener in cosmetics and personal care products. You’ll find it in cleansers and detergents, and even as an absorbing ingredient in diapers and tampons. According to the Cosmetics Database, it’s considered a moderate hazard ingredient because it may be contaminated with toxicity during processing. These two ingredients aren’t necessarily unsafe on their own, but manufacturing processes can result in contamination with unwanted ingredients. The problem is, there’s no way to tell by looking at the bottle whether a product may contain contaminated polymers. Polymers are a complex, large class of chemicals, so we can’t really list them all or all the specific safety concerns of each one in one post. In addition, there just aren’t enough scientific studies out there yet examining the long-term use of a combination of these ingredients, such as many people are exposed to today. We will continue to keep you updated as more information comes in about specific synthetic polymers and their potential risks. In the meantime, we just wanted to let you know a little bit about them—and of course, to remind you that we don’t use any of these in Annmarie Gianni Skin Care products. Have you heard about concerns with synthetic polymers? Please share your thoughts. Moore CJ, “Synthetic polymers in the marine environment: a rapidly increasing, long-term threat.” Environ Res. 2008 Oct;108(2):131-9, http://www.ncbi.nlm.nih.gov/pubmed/18949831. Eric Abrutyn, “Polymers in Personal Care,” Cosmetics & Toiletries, June 28, 2010, http://www.cosmeticsandtoiletries.com/formulating/function/aids/97338339.html?page=6. I have been suffering from eczema for many years and last year a dermatologist advised me to have the allergy tests done. To my surprised I found out I was allergic to acrylate, a product contained in gels in acrylic nail varnishes. I stopped having my nails done hoping that it would improve the condition of my skin on my fingers. it did improve slightly but not completely. Lately my eye lids started flaring up ( similar symptoms to having the gel manicure done) and I started wondering whether there are other cosmetic products that contain acrylates that might be causing the allergic reaction. Any suggestions would be greatly appreciated. I have the exact same problem. i noticed that whenever i would get acrylic nails or paint my nails my fingers would get really itchy and red. and then i noticed the same thing happening on my face. acrylates are in a ton of makeup from eyeliner, lipsticks, foundtation, etc. anything creme or liquid based usually contains acrylates so i have to be really careful when buying stuff. usually the proctuct box will have the ingrident list on it but if not i just google the ingridents of the procduct. its difficult and annoying at times but better than having a reaction to it. hope this helps somewhat!